Voyager 1 Southern Hemisphere Mosaic and Taking another look at Voyager 1 images of Io - We re-examined some of the images acquired by Voyager 1 during its flyby as I reassembled some of the mosaics the spacecraft acquired, including one covering much of the southern, pro-jovian hemisphere of Io. By looking at some of the wide-angle camera images, it looks like we can fill in some of the low-resolution gap in the global map of Io, particularly over Masubi and the terrain just east of Shamshu Patera. 30th Anniversary of the Discovery of Volcanism on Io - Finally, we looked back at the discovery of Active Volcanism on Io, of volcanic plumes on Io. For this post, I want to wrap up our coverage of the anniversary of the Voyager 1 flyby by look at how our view or model of how Io works changed as a result of the flyby and how that model compares to our perspective now. 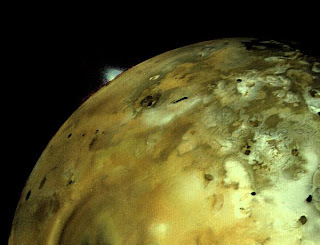 Before Voyager's close-up look in 1979, not much was known about Io. We knew from spectroscopic studies of Io and its environment that Io had sulfur on its surface and that is was surrounded by a cloud of sodium. 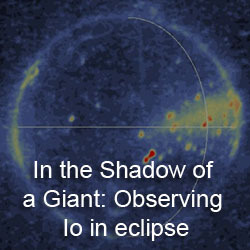 From the earlier Pioneer 10 and 11 encounters, we also knew that Io was centered in one of Jupiter's radiation belt. This led to the hypothesis that the sodium cloud surrounding Io was the result of sputtering of an evaporite deposit, rich in sulfur and halite (also known as table salt), on Io's surface. In terms of its interior and geology, Io was expected to have an ancient surface similar to Earth's own moon considering that both worlds have a similar size and mass. This model obviously changed as a result of the Voyager 1 flyby. Instead of an ancient surface, Voyager found a geologically active world with volcanism and mountains produced through tectonic motion. The images and spectra returned by the spacecraft provide brilliant confirmation for the model by Stan Peale, Patrick Cassen, and R. T. Reynolds that Io's interior was heated by the varying tidal pull of Jupiter on Io. This variation in the tidal pull is the result of the forced eccentricity in Io's orbit induced by the moon's orbital resonance with two other Galilean satellites of Jupiter, Europa and Ganymede. Over the next few years following the Voyager flybys, two competing models of Io's interior and geology developed. Simplifying things a bit, the two models basically attempted to explain what the composition of Io's lavas were. 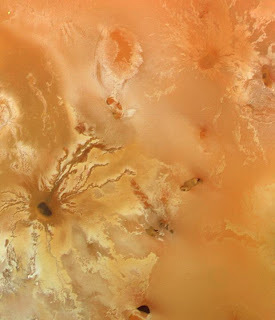 In one model, all the volcanism on Io could be explained with sulfur. 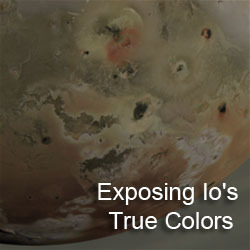 In this model, Io was overlain with a thick layer of sulfur and sulfur dioxide. The top layer of this sulfur would be solid, but it liquefied the further down you went, until you had a nearly global sulfur ocean underlying a solid sulfur crust. Imagine Europa with its water ice shell and water ocean underneath, but with sulfur instead of water. 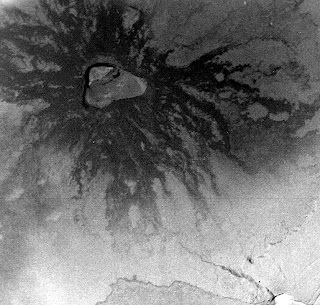 The multi-colored flows Voyager observed were explained as being the result of sulfur and its various allotropes flowing out across the surface; the dark volcanic pits were filled with boiling, pitch black sulfur. Underlying this sulfur shell was the silicate lithosphere. This lithosphere had to be active itself, as the mountains on Io had to consist primarily of silicates in order to sustain the heights seen by Voyager. In these cases, the mountains consist of parts of the silicate crust poking up above the sulfur shell. Silicate volcanism was thought possible beneath this shell, as silicate magma reaches up to the level of the sulfur-silicate interface before forming a sill and heating the sulfur above it. 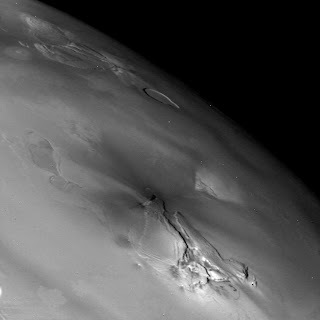 This model of primarily sulfur volcanism was supported not only by Io's multi-colored surface, but also by the temperatures seen at Io's volcanoes by the IRIS instrument on Voyager. In the other model of Io's interior and volcanism, Io's crust consisted primarily of silicate rock with only a thin veneer of sulfur and sulfur dioxide. In this case, Io's lavas consisted of silicate rock, like volcanism on Earth (with some exceptions), with a sulfur enrichment. At the time of the Voyager flybys, this model was supported by the topographic structures visible on Io, which were not thought to be supportable by a crust that consisted primarily of sulfur. However, the thermal data to back it up didn't really come until 1986 when an eruption on Io's leading hemisphere was observed from Earth, and the blackbody radiation temperatures of the eruption were too high to be explained by sulfur. Other eruptions, including an eruption at Surt in June 1979, also had temperatures too high to be explained by sulfur. The lower temperatures seen by Voyager could be explained by the fact the IRIS instrument's wavelength band-passes were in the mid-infrared, wavelengths too long to sense the high-temperatures consistent with silicate volcanism. The discoveries made by Galileo in the 1990s and early 2000s seemed to put the nail in the coffin for the sulfur volcanism model as high-temperature volcanism (> 1000 K) was observed at many active volcanoes on Io and absorption bands consistent with orthopyroxene were found in some of Io's pyroclastic deposits. The current consensus view of Io's volcanism, interior, and geology is in many ways seems like a merging of these two models. This consensus view was published in 2004 by Keszthelyi et al.. In this model, Io's crust consists primarily of silicate rock. As depth decreases, or as your approach the surface from Io's interior, the amount of sulfur in the lithosphere increases. This sulfur and sulfur dioxide is constantly being brought back up the surface, or recycled, by silicate volcanism. However, as silicates rise through the lithosphere from deeper magma reservoirs, they stall out as they become neutrally buoyant and form sills. These sills heat up the sulfur near it, which then melt, forming a depression on the surface and leading to sulfur volcanism (and some silicate volcanism as well). 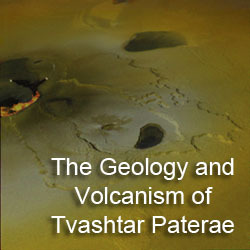 Over time, this depression deepens, allowing more silicates to reach the surface until the sill is unroofed and the bottom of the depression, or patera, becomes a silicate lava lake. I posted a more detailed explanation of this process last week. The Voyager encounter with Io in March 1979 greatly increased our knowledge of Io as well as the rest of Jupiter system. It changed how we view the worlds of the outer solar system, making us scientists always expect the unexpected when we look at these worlds, even with an orbital mission like Cassini, where we have found active cryovolcanism on Enceladus and a dynamic climate system on Titan capable of producing large lakes at that moon's pole and great sand dune seas and canyonland terrain in the equatorial region. It has been a pleasure looking back at the Voyager encounter with all of you. I hope you all enjoyed the mosaics I have put together over the last few days :) And thanks to Emily Lakdawalla for the shout-out on her blog.